Once you've got your heart set on one of our heating & air conditioning solutions, you may be inclined to check your credit card or home equity line for financing options. But wait... before you tap into those resources, check out the great financing options that Spicer Mechanical has put together for our customers. 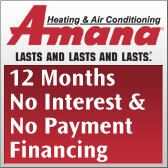 We are currently offering 2 special Amana Financing options as well. Click on either button below for more information and to prequalify on each specific plan. 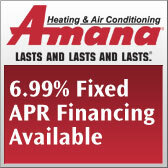 You can also contact us today for more details on HVAC Financing!